Today’s Page has a message for everyone, and, it is important to listen carefully. The Universe has been weaving its magical threads, making a new beginning in some area possible. This card serves as a reminder that while we tend to our own lives in the most creative way, that the Universe is setting up the possibilities which will come your way toward your hopes and dreams. Pay close attention to your intuition today, if you feel it has something to offer. 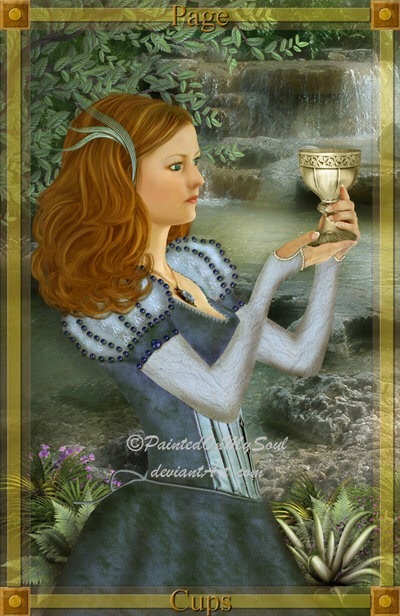 I always say that the Page of Cups tells us there is no such thing as coincidence. Understanding this perspective can truly aid one in interpreting the message the Universe is offering up today. You are on your way to somewhere special, and trusting that it will all work out as it should is very key now. Allow yourself to think outside the box, as you work on the masterpiece which you currently have in creation. It will soon be time to show the world. This entry was posted in Card of the Day, General Tarot, Patreon, Readings, Weekly Tarot Guidance, YouTube Videos and tagged Guidance, Page of Cups, Path, Reading, Tarot.